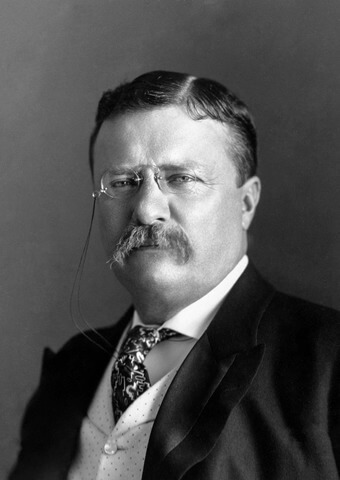 Theodore Roosevelt (1858 - 1919) was an accomplished historian, author, naturalist, soldier, and reformer who served as the youngest U.S. President to assume office at the age of 42. He applied an exuberant "cowboy style" from his days serving in the Spanish-American War with the Rough Riders to his politics, leading the charge during the Progressive Era in the early 20th century. We offer some of his biographical sketches from the book he co-authored with Henry Cabot Lodge, Hero Tales from American History (1985). Roosevelt grew up in New York City with terrible asthma, was home-schooled, and became a passionate, life-long naturalist. (As president he would found the national park system). He attended Harvard, published his first of many books in 1882 on the Naval War of 1812, which earned him a reputation as an historian and popular writer. He also wrote the six volumes, The Winning of the West (1889-1896) and The Life of Oliver Cromwell (1900). Roosevelt entered politics as a Republican reformer in New York's legislature, and after his wife and mother died, he went out West and ran a cattle ranch in the Dakotas. He served under President McKinley as the Assistant Secretary of the Navy for a short time before quitting and joining the Rough Riders where his bravery during the Spanish-American War led to his popularity, he reformed the nation's civil service, served as police commissioner of New York City in 1895 to bust corruption, which lead to his win as New York's governor in 1898. Party officials distrusted him, so they engineered his placement as the powerless vice president on William McKinley's presidential bid in 1900. McKinley won, but was assassinated six months later, after which Roosevelt ascended to the presidency, and was re-elected, serving from 1901 to 1909. 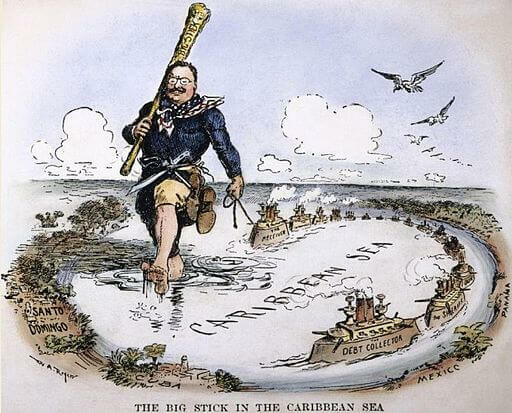 Theodore Roosevelt led a brash and outspoken presidency, including his often quoted foreign policy of "speaking softly and carrying a big stick." He championed the "square deal" for all Americans, promising to break trusts, regulate railroads, and ensure pure food and drugs. Much of his legislative agenda was blocked by Congress, but he successfully groomed his friend William Howard Taft as his successor. 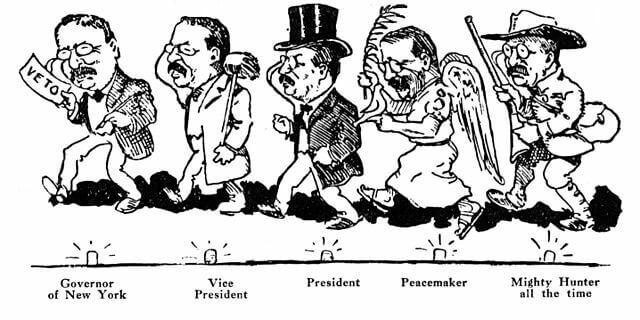 After Roosevelt's presidency, he went on safari in Africa, toured Europe, then became frustrated with Taft's policies, failing at another presidential bid in 1912, then tried to form a third progressive party, called the "Bull-Moose" party. 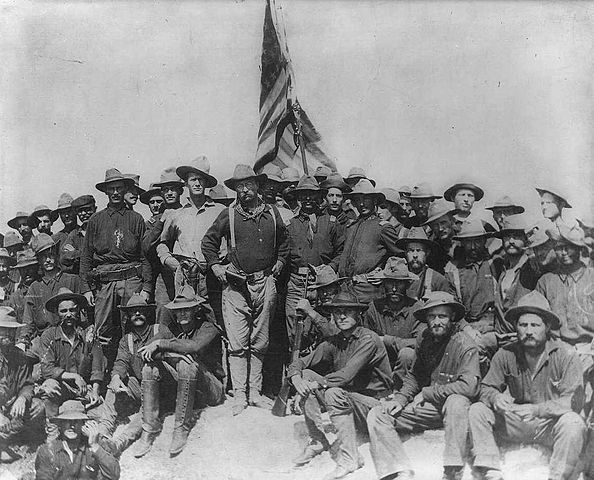 Roosevelt leaves a long legacy of passion and commitment to the rights of the individual and the outdoors, forming a national park system, and inspiring the name "Teddy Bear" after a hunting trip in 1902. The first stuffed toys bearing his nickname were sold in 1903.